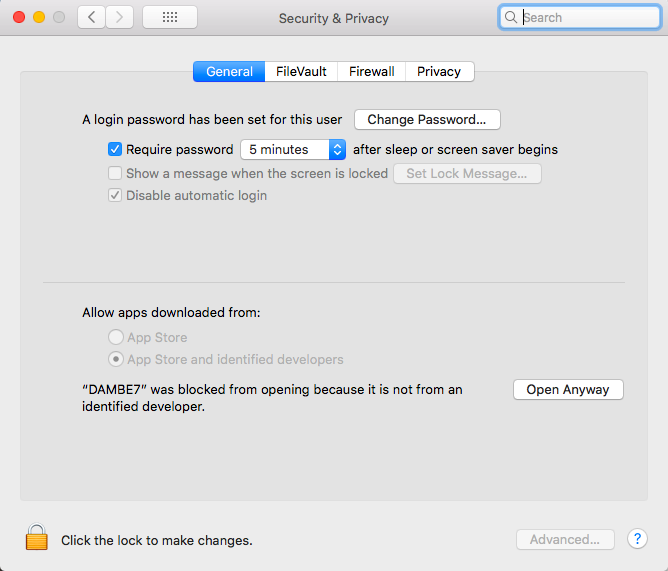 I finally found a simple way to install DAMBE on MAC Sierra/High Sierra. Download DAMBE7.zip. MAC will automatically unzip it to DAMBE7 in the download directory. Double-click DAMBE7, then choose Open from the shortcut menu. For MACs with El Capitain, DAMBE7 will run right away. For MACs with Sierra/High Sierra, you may see the following warning. Click OK and DAMBE will run. After this, you can run DAMBE by just double-clicking it.